It snows in the city of Kyoto several times each winter but, most of the time, the snow just lasts for a few hours. Since snow is so rare in the Kyoto area, you can’t possibly plan your trip for snow. However, maybe sometime this winter you will be lucky enough to see some beautiful snowy scenery. If you happen to be in town when Kyoto magically transforms, I recommend rushing to the nearest Zen temple to see its snow-covered gardens; Tofuku-ji Temple, Daitoku-ji Temple, Ginkaku-ji Temple and Nanzen-ji Temple are the best choices for the most striking winter moments. But do hurry: the snow may well have melted by lunchtime! The best thing to do is wake up very early and check the weather report. If it is snowing, head straight to the place you want to see the most because the whiteness might not last. Breakfast may have to wait! There is a greater chance to see snow in the mountains: it’s often possible to see snow-covered temples in the Kitayama Mountains, north of Kyoto. You can get there by boarding the Eizan Railway to Kibune and Kurama, which is an easy 45-minute trip from the city centre. If you want to experience a white Japanese winter surrounded by snow-covered trees, you can consider spending a night at Japanese ryokan in the Kibune area. Kyoto experienced a heavy snowfall on 14th & 15th January 2017: more than 20 cms of snow fell. 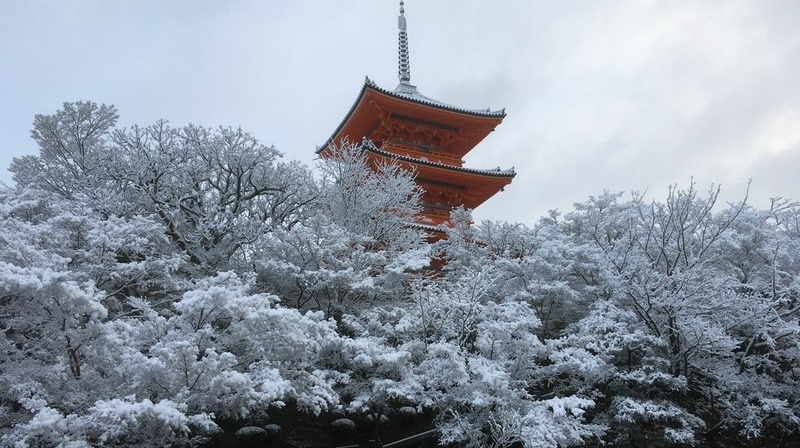 I travelled around Kiyomizudera, Enko-ji Temple, Tanukidani Fudo-in, Kinkaku-ji Temple in Kyoto and Tenryu-ji in Arashiyama to have a rare snowy experience. ← Omamori/ Japanese Amulets keep you safe!